Iliad Design’s latest 1/48 decal release gives post-war Mustangs the same treatment it recently gave pre-war Spitfires, by taking a familiar aircraft and dressing it in a less familiar scheme. 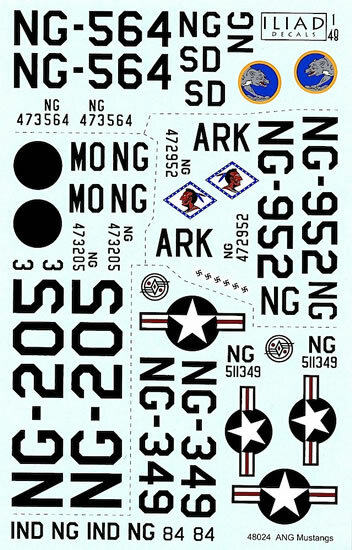 Most P-51D decals – both kit and aftermarket – provide markings for USAAF aircraft that were based in Europe during World War 2, and to a lesser extent Pacific-based, Commonwealth and/or Korean War Mustangs. This attention is understandable (given the P-51’s contribution to defeating the Luftwaffe, particularly) but also results in other, interesting aspects of Mustang service being overlooked. P-51D-25-NA, 44-72952, flown by Major H.H. Kirby, 154th Fighter Squadron, Arkansas National Guard, late 1946. This aircraft carried five swastikas on the canopy frame, representing Major Kirby’s wartime victories, and 154th FS insignia on the fuselage sides where national insignia would normally be located. P-51D-25-NA, 44-73205, 110th FS, Missouri National Guard, late 1946/early 1947. 44-73205 had a contrasting white spinner and black fuselage disks, which Iliad speculates may have been created by overpainting earlier insignia from a different unit. P-51D-25-NA, 44-73564, 175th FS, 132nd Fighter Group, South Dakota National Guard, summer 1947. Arguably the most colourful of the four aircraft, 44-73564 had a red spinner and bright blue and yellow 175th FS emblems on the fuselage. P-51D-25-NT, 45-11349, 113th FS, Indiana National Guard, 1949 (noting the date, this Mustang should perhaps be described as an F-51D). 45-11349 is the only aircraft here with fuselage national insignia – the unit emblem was carried further forward, beneath the cockpit. I haven’t been able to find photographs of these machines, but in my experience Iliad’s research into aircraft finish and markings is usually thorough. The double-sided, full colour instruction sheet follows Iliad’s usual style. 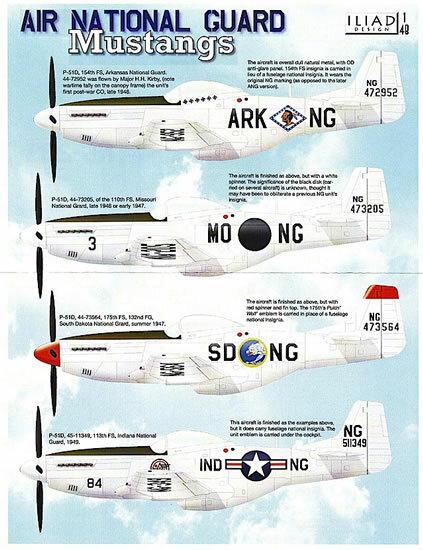 On one side there is a port profile of each Mustang, along with relevant aircraft and unit details, and on the other side there are four overhead views, on to which the underwing marking locations have been lightly ghosted. These are good basic instructions, but in my view there is some important information missing. For example, there were often differences in detail between Mustangs, which could be fitted with different propeller blades, canopies, exhaust fittings and other pieces of equipment. None of these potential differences are noted in the instructions, and references are not provided for anyone wanting to conduct further research. The decals appear to be high quality. There is not a lot of colour on the sheet, but the 154th and 175th FS emblems, particularly, are finely reproduced, with excellent detail and registration. The dimensions of the national insignia compare favorably to those I have seen in photos of other ANG Mustangs, but I will leave the question of whether or not the insignia are 100 per cent accurate to others who have a greater knowledge of the subject. One point worth noting is that there is a lot of carrier film around the serials and codes. This is necessary, given their shape, but to avoid silvering modelers will need to apply the decals on to a high gloss surface, or carefully trim away some of the carrier film, or do a combination of both. This is another excellent choice of subject by Iliad. While I would have liked to see more information provided about each aircraft, determined researchers should be able to discover this for themselves. Minor gripes aside, I highly recommend these decals. They will make your 1/48 P-51D model stand out instantly from the competition, while at the same time highlighting an important part of the Mustang’s service history. Thanks to Iliad Design for this sample.